Jacob Buck’s family has been growing potatoes in Aroostook County, Maine, since 1958. 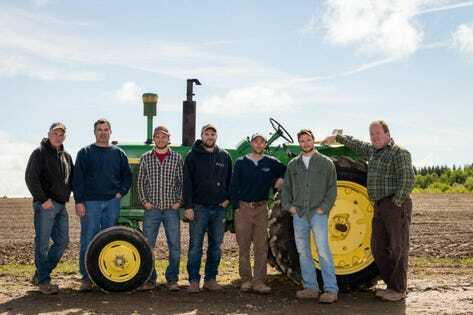 Now Buck and his three brothers – all in their 20s – are taking the farm in a new direction in an attempt to make the 1000-acre farm support them and their growing families. Three of the Buck brothers are married, and Jared Buck has two baby boys. Caleb and Jacob are twins who just turned 26 years old. Josh is 27, and Jared is 30. And yes, Jacob Buck says, their mother deserves your deepest sympathy. These brothers were all driving tractors by the time they were 10 years old. Jacob Buck said his brothers, father and uncle have regular meetings to talk things over, and “get on the same page.” They all have different visions for what’s best for the farm, and what’s best for the next generation, but they all agreed they weren’t going to get to the future they wanted – keeping everyone on the farm – by just continuing to grow potatoes. Buck Farms is still growing potatoes, but it is also taking advantage of the booming craft beer market by supplying malted barley to some of Maine’s 130 breweries. Buck Farms supplies the breweries through a new business formed in 2015 called the Maine Malt House. Harvest time for barley at Maine Malt House, Mapleton, Maine.Courtesy of Maine Malt House. The Bucks looked at other possibilites before they settled on malted barley. They looked at getting their hands on more land to be able to handle bigger potato contracts. But agricultural land – even in Maine’s largest and one of its poorest counties – is “super expensive,” Jacob Buck said. “We couldn’t figure out how to do it and be completely comfortable with the decision to tie up the money and equipment you only use for two weeks of the year,” he said. With more acreage, the Bucks would need another planter, a $300,000 to $400,000 machine they would use for two weeks during the year. They would also need another harvester at half a million dollars, again using it for two weeks during the year. The Bucks looked at other crops they could grow using the equipment they already owned, including beets, sugar beets and onions. Then somebody asked the Buck brothers if they had ever thought of growing hops? After all, there sure were a lot of breweries in Maine. The Buck boys visited Sea Dog Brewing Company in Bangor. The propietor there said, how about barley? Can you grow that too? If you do, malt it up and send it down to us. It was all the Buck brothers needed to hear. Barley growing at Buck Farms for Maine Malt House.Courtesy of Maine Malt House. It was the spring of 2014. The Bucks had one of their regular meetings, at which they discussed the fact that they couldn’t garner enough interest in specialty crops like beets and onions to go down that road, but there did seem to be a strong interest in malted hops and barley. They sent a survey out to the 41 breweries in Maine at the time and heard back from 50 percent of them with some level of interest – a high rate of return. The building that would become the Maine Malt House was 18 feet deep with potatoes. The risk appears to be paying off. The Bucks have settled on barley rather than hops. Jacob Buck explained that the hops season coincided with the potato season and the family still wants to grow potatoes, making it difficult to also grow hops. Farm Truck and Tractor, Buck Farms, Maine Malt House.Courtesy of Maine Malt House. But barley opened up more opportunities for this farming family. The Bucks invested in grain cleaning and conditioning equipment that makes germinated barley yield more alcohol per pound. Now they could also clean other grains for other farmers and used the newly acquired equipment to put on applications for fungicides and insecticides. Then, they started packaging feed for hardware stores all over New England, calling it Buck Farm Grains, mostly for horse feed. Everything was up and running after a year, by January 2015. Buck said he feels good about the direction the farm is headed, and about keeping the whole family together. Looks like there’s going to be room on the farm for many Bucks to come.